Recent studies have shown that the prevalence of myopia is on the increase (by over 70% in Asia & by up to 50% in the US & Europe). The earlier onset of myopia in the last two generations has naturally lead to higher degrees of myopia in later life increasing risk factors for several ocular pathologies including glaucoma, cataract, retinal detachment, & myopic maculopathy brought about by the accompanying elongation of the eye in high myopia (>-6.00DS). One or both Parents being Myopic. Being myopic at a young age. If you are myopic (short-sighted) you may be concerned that your children may become as (or more) myopic as you. We know from experience that myopic parents often have myopic children, the need for spectacles often starting in the early teens (sometimes earlier if parents have a history of earlier myopia). Typically as children grow through the teenage years they become progressively more myopic. We used to think that this was mainly due to the eye growing with the rest of the body. A myopic eye has a physical axial length which is too great for its focal length; as a result a target is focused in front of the retina and thus blurred. Negative powered spectacles or contact lenses are then needed to focus the target on the central retina and be seen clearly. What can we do to try & prevent myopia & its progression? Strong evidence exists that spending time outdoors (more than 2 hours per day) can protect against the onset of myopia and possibly reduce the final level of adult myopia. The total time spent outdoors appears to be the important factor, rather than the nature of the activity undertaken. Recent theories & studies are now suggesting that one of the reasons for myopic progression is that conventional spectacles and contact lenses are such that whilst the central image formed on the retina is in focus, the peripheral image formed by these lens designs is behind the peripheral retina. It is thought this may promote elongation of the eye as it attempts to form an image on the peripheral retina. 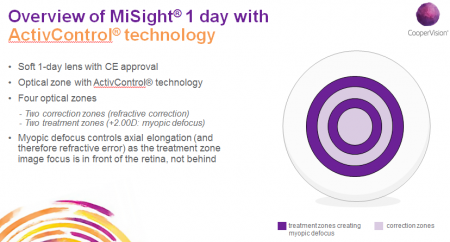 MiSight® 1 day are a disposable contact lens that are specially designed for the purpose of correcting a myopic prescription whilst at the same time trying to slow the rate of progression of the short-sightedness. The effectiveness of the MiSight® 1 day lens is supported by 3 years of clinical trial studies. 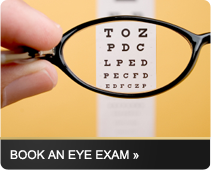 Reduces myopic progression, slowing the rate of increasing short-sightedness. – 41% of Px’s had less or equal to -0.25DS progression over 3 years. – 67% of Px’s had less or equal to -0.75DS progression over 3 years. 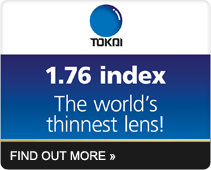 Lenses are comfortable and deliver suitable oxygen levels for daily wear and eye health. 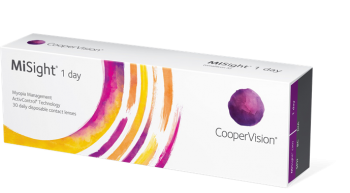 MiSight® 1 day is fitted in the same way as any other soft daily disposable lens. MiSight® 1 day lenses need to be worn for a minimum of 10 hours per day for minimum of 6 days per week to get the maximum treatment effect. Children with < 0.75D of astigmatism can be fitted with MiSight® 1 day. For children with 1.00D or more of astigmatism ghosting may occur and in such cases MiSight® 1 day can still be worn but spectacles that correct the astigmatism worn in addition to the contact lenses. Not having to clean the lenses and with lost or damaged lenses easily replaced daily disposable lenses are the ideal option for even young children. Contact lenses offer children a number of benefits including improved quality of life, self perception, ability to participate in sports, and improved perceived social acceptance. Cargills Optometrists routinely fit children with contact lenses, even younger children are fitted if their motivation and level of maturity are high. Children, including young children, have demonstrated their ability to wear & handle contact lenses successfully. Previous approaches to manage myopia progression include atropine, Ortho-K and bifocal or progressive addition (PAL) spectacle lenses. Pharmalogical e.g. Atropine has been shown to slow down the rate of progression of myopia however it has side effects including photophobia and reduced accommodation as well as long term safety concerns. Ortho-K was originally developed to control refractive error, however it is believed flattening the central cornea can also induce an effective peripheral power profile that may control eye growth. Bifocal and PAL spectacles have been used to try and slow the rate of progression of myopia. Results have been variable and mixed perhaps due to non compliance in terms of ‘looking round’ the near zones of the lenses.